It wasn’t morbidity that drew me to that dangerous place but rather the pleasure of abandoning myself to something vastly beyond my control. 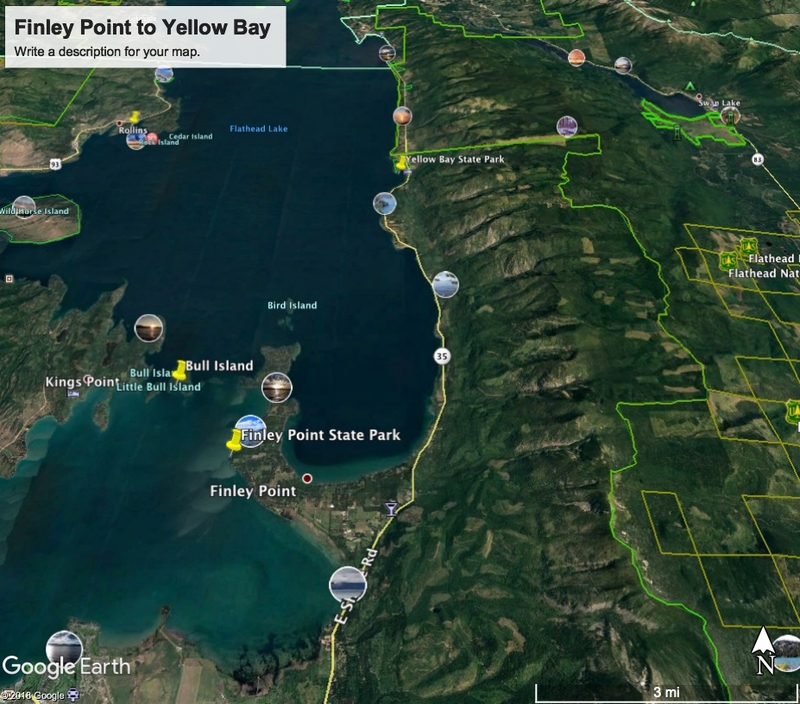 On June 6, 2018, between a late picnic and dinner, I paddled from Finley Point State Park to Yellow Bay State Park, about ten miles northeast as a kayak tracks. On the way I stopped briefly at Bird Island for a drink of water. When I left the island I suddenly felt the gap between the island behind me and the east shore of Flathead Lake about three miles to my right. Until then the peninsula and the island had been protecting me from this awareness. As I concentrated on smooth, rhythmic strokes, a phrase kept floating through my mind—this vastness. I felt the expanse between kayak and shore, the column of height and depth between lake level and the peaks of the Mission and Swan ranges above me, the distance between where I launched and where I hoped to arrive. In the process I kept picturing my kayak from above. This had happened once before, years ago, when I paddled from Finley to Wild Horse. From a vantage point outside myself the kayak seemed like little more than a pine needle on an infinite sea, a blade of grass afloat on a flood. Ever since this experience I’ve been pondering the mid-paddle mantra that came to me in the course of this trip. It is sometimes a challenge to be where one is, however far from shore. Faced with vastness one can become anxious. It is easy to feel an internal pressure to shorten the gap and close the distance, while peaceful acceptance of vastness calms the mind. Trying to be where I was, far from shore, it occurred to me that in the West we are often given an opportunity to see ourselves in scale as we move through the vastness around us. The mind flies toward the heights and reaches out across the water or the plains. In the process we come to see ourselves as a tiny body of being surrounded by distances not frequently experienced in the confines of urban environments. Before the depths of sky and all the miles in view we see ourselves in perspective. Especially in a kayak there is little danger of overestimating one’s power and influence in the face of such landscapes. We are little more than a speck, even if a conscious one. When I finally popped the skirt, extracted my legs, and pivoted over the combing for a soft landing on the rounded stones of shore, I felt grateful for the chance to move through the vastness that remains the context and measure of all human things.